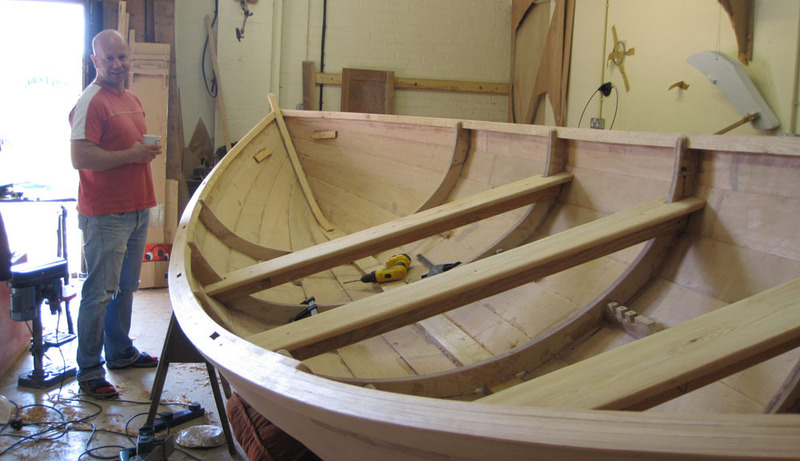 In October 2009 Robbie Whiteman, convenor of the SCRA, attended a PS&KC meeting at the Beach House to explain the Scottish Fisheries Museum initiative to re-introduce rowing to the Forth through community boat building. Ali Grant & I immediately caught on to the idea and we discussed how we would go about it. I agreed to find a workshop space and buy the first kit from Alec Jordon in Anstruther. We were one of the first clubs to purchase the kit, which gave Alec the cash to buy some marine plywood. Ali said she would get the funding for it! I called Nik, who was in France at the time and he was enthusiastic to lend his tools & his joinery skills to the project. As part of raising awareness of the project in Portobello we managed to get the first prototype skiff which Alec had built, to Porty beach for a trial row. Everyone who came along was captivated by the boat on the flat sea in January, on a sunny afternoon. By January 2010 we had secured the workshop space from BL Developments at the old power station site. The best thing about it was that it was free! By February 2010 we started building Ice Breaker and by May we had her launched, a few days before the inaugural skiff regatta at Anstruther. In the mean time Ali had secured funding from the Lottery Heritage fund and we were already thinking about building a second boat. However, Nik & I were wondering if anyone would row the boat while we were painting Ice Breaker. 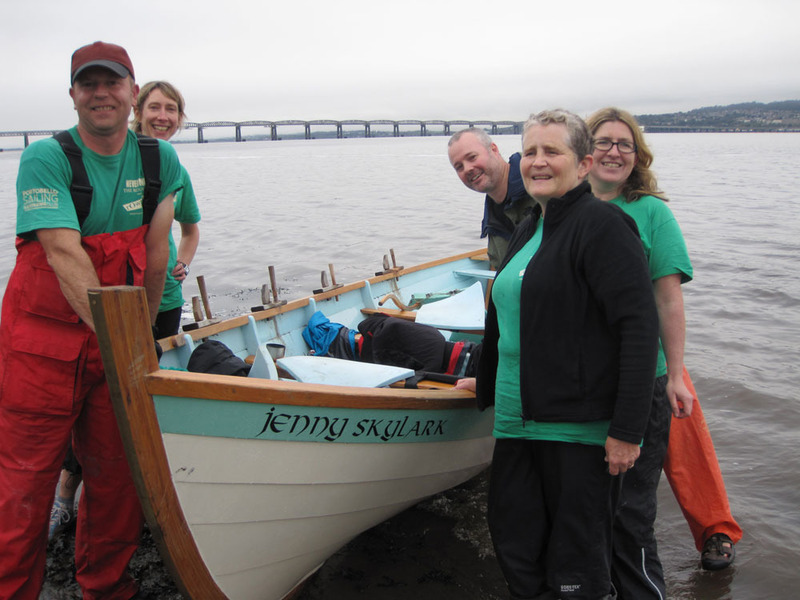 Jenny Skylark was built with many more hands (around 30) and it took all winter (Dec — April) and she was launched with much funfair with BBC Alba in attendance. Since we have attended regattas in Port Soy, Achiltibuie, Dunbar, North Berwick, Port Seton, Anstruther, South and North Queensferry, Ullapool, and we have run 2 successful regattas in Portobello. We have also rowed the Tweed, the Tay, the Union Canal, Musselburgh Lagoons (twice) & Inchcolm Island. The boats have been in constant use around 5-6 days per week with over 80 paid members getting out on the water. We have unwittingly created a dynamic community group with a wide range of ages and people from many walks in life. My happiest moments include launching Ice Breaker, launching Jenny Skylark, reading the kids stories to name Ice Breaker, winning the men’s open in Achiltibuie! And ending up as champions for the 2011 regatta season. My worse moments include loosing 2 generators, arguing with Nik, arguing with Ali, arguing with myself and neglecting my family. We set out to build a boat, but we ended up with RowPorty, a wicked rowing club, filled with an eclectic blend of newcomers and old timers. RowPorty gives people easy access to the sea through a healthy sport that is inclusive, extremely social, great fun, open to all. We launched both boats using pagan rituals and we have remained a-political; the core value is to have fun and we have remained un-stuffy, relaxed and welcoming. So we have 2 lovely boats fully kitted out, a place to store them, a quad to launch them, a good IT forum (BigTent), a busy blog, a wide membership, a cabinet full of trophies, blisters, sore bums and a whole lot of old and new friends. As we look into the future I hope we can maintain the enthusiasm for rowing in Portobello which must include more younger people. I hope the club can continue to maintain its core (slightly) anti-establishment values. I also look forward to many more expeditions to explore new routes that can become established, and safe, adventures for all members. I would also like to see a better integration with the PS&KC and many more successful Portobello Rowing Regattas. Finally, I would like to thank you all for all your support and encouragement over the past 2 years. I would like to wish the new co-convenors (Sean and Emma – SAMENAME) the best of luck for the year ahead and I am sure we will all support them in any way we can. 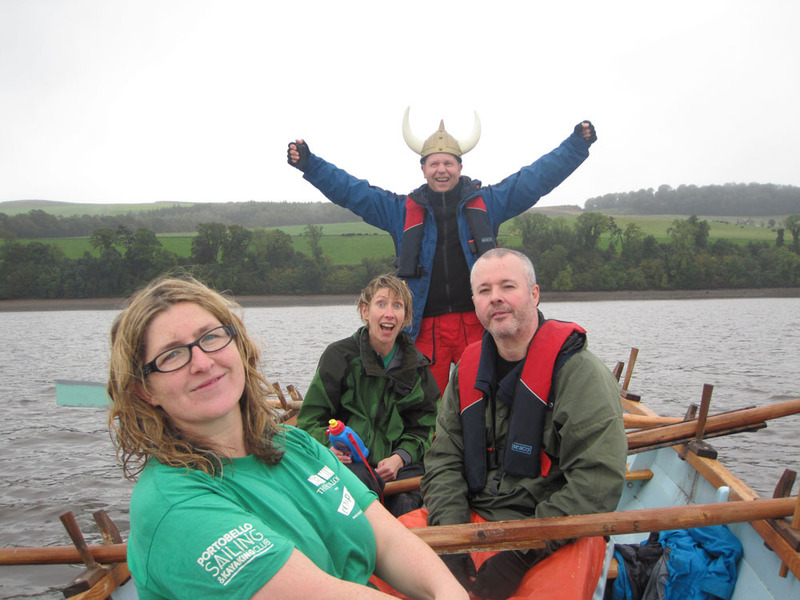 Sunday had always threatened to be rainy, but would it be heavy / light & would it impede our plans to row down the Tay? When Sunday dawned & Sally, Roisin, Andres, Neil & I met in the yard at 7am – it was wet. It rained most of the way to Perth, & it seemed intent on setting in for a thoroughly miserable day. We launched from the slipway of the Perth Sea Cadets, Anstruther were already there when we arrived, & North Berwick followed soon after. B ut Port Seton, the hosts, were later than expected. We set off at 9.30, 4 skiffs & a rescue boat. 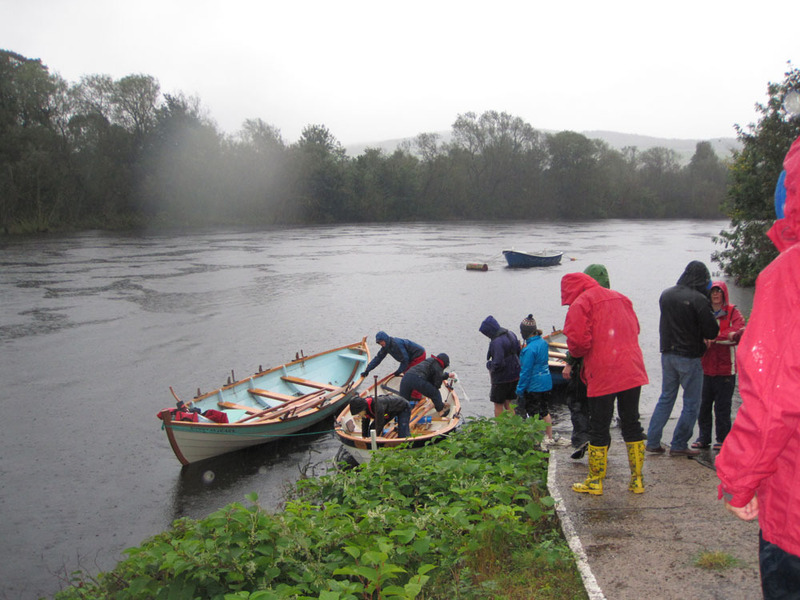 The rain was unremitting, but spirits were high as we embarked on our adventure. The flow of the river & the tide helped us, but soon a breeze blew in from the estuary. The rowing was good & we rotated as usual to keep warm & share the load. After 6/7 miles we arrived in Newburgh where we took a planned break. Being first out of the boat I was quickly ankle deep in slimy mud, yuck! We were welcomed by 3/4 folk who are about to start building a skiff, & got the use of a large shed for having our snack & coffee. Whilst there, it became apparent, that the other teams were intent on jacking in the rest of the row: the wind would be too strong, the tide would be against us by the time we got to Wormit, it was dangerous etc etc. I’m happy to say that none of Rowporty’s intrepid explorers had any such qualms, & we quickly decided to proceed with / without them. Andrew in the rescue boat would have come with us, but was needed for driving. So we set off on the last leg alone. By this time the rain had stopped, & although the day remained overcast it stayed dry for the rest of the row. We slowly dried out, & enjoyed lots of banter; although it was hazy, we could see the Tay rail bridge from quite early on, but tantalisingly, it seemed to take us forever to get there. Although the wind was against us, we’ve rowed in much tougher conditions at some of the regattas. 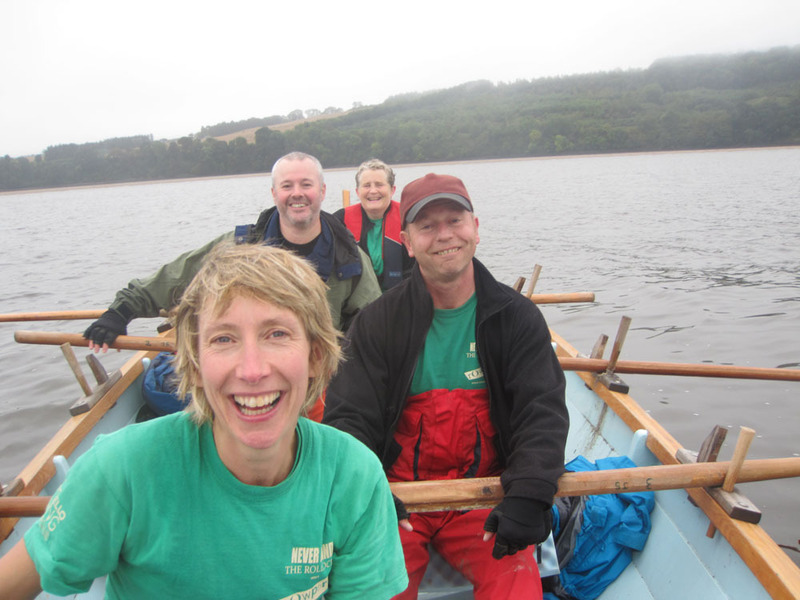 But it was a long row, so we were glad to arrive at Wormit, between the 2 Tay bridges, after a 21/2 hour row from Newburgh. Andrew, of the rescue boat, had phoned to check on our progress, & was there to meet & help us out of the water. Despite the early rain, we had a cracking day out, & arrived back in Portobello at 5.30 having stopped en route for a well earned drink in Cupar. Thanks to Brenda of the Perth Sea Cadets for turning out to welcome us, Andrew & Andres for reccying the route, Andrew for rescue boat cover & Newburgh folk for giving us shelter in a shed.